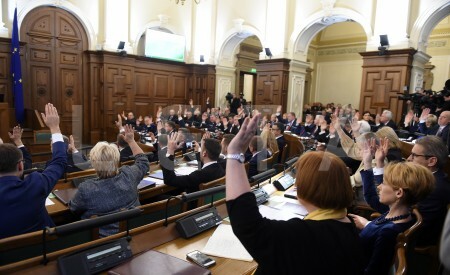 RIGA, March 20 (LETA) - Saeima passed Latvia’s draft budget for 2019 in the first reading today. Representatives of the Finance Ministry indicated that as a result of a revision of this year’s budget expenditure, EUR 51.3 million would be saved in the 2019 budget, of which EUR 7.6 million would be used to improve the fiscal space and EUR 43.7 have been earmarked for ministries’ priorities. In this year’s budget, EUR 87.5 million have been allocated for raising medics’ wages, EUR 8.9 and million for raising salaries to judges and court employees. EUR 7.2 million have been earmarked for measures aimed at combating money laundering and the financing of terrorism. EUR 3 million will be spent enhancing the work of independent institutions like public media, the Ombudsman’s Office, the State Audit Office and others, and EUR 2.6 million will be provided to activities intended to support the Latvian diaspora in foreign countries. Latvia’s defense funding will grow by EUR 60.3 million from last year, also in order to maintain defense spending at 2 percent of GDP. This year, local governments will receive 19.4 percent of Latvia’s total tax revenue.